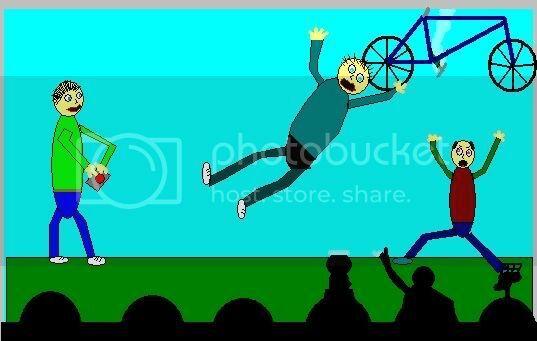 Concerning the cartoon below- Tom Servo might be too big, and Mike may be misshapen and lean-to, but thats a pretty cool Crow silhouette I drew there. Ok, I been kinda busy. The online US Government simulation I play in was going through an election cycle. And unfortunately I lost my race as Republican Governor of Texas. The upshot is it was a huge drain on my time, and I can get back to my beloved crappy cartoons. So, here goes with a keyword search I'm pretty sure this site failed to fullfill. Actually, the funniest thing about this cartoon was the fact that I had to do a google image search for "bike" to remember what one looks like. You can see it helped.